How Did We Make A Mark At Imagine 2017 & Why Were We There? 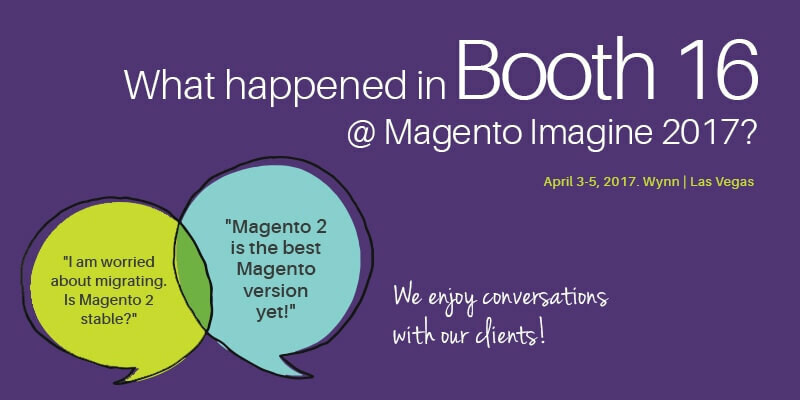 What Happened At Booth 16 At Magento Imagine 2017? In the first week of April, a versatile team of CRO Experts from The Commerce Shop headed to Las Vegas for Magento Imagine 2017. Many tech enthusiasts and business owners had walked into our Booth 16 to figure out what we have in our closet to improve their business. And they walked out with valuable tips along with a sense of saving more for their company. Our experts at the Booth were ready for their knowledge sharing session to help the business owners and stakeholders of SMEs, Startups and Corporates to return to their respective operational cities with a much better idea of Conversion Rate Optimization (CRO)! Now, What Happened At Magento Imagine 2017? There have been a lot of interesting things that were a part of Imagine 2017. People were very curious about a lecture on “The Future of Magento Cyber Security” which led to a lot of discussions on automated security testing for Magento websites. There was a serious discussion on “User Experience at Magento” and there was also a talk on receiving a regular update on how Magento tests their software and takeaways that people can apply to their business. We went to Imagine to educate people on how increasing the CRO of eCommerce websites can increase the online sales. We shared a lot of insights on how 50% of companies miss out on Mobile Conversions by not making their website compatible on a mobile device, while the desktop traffic is at 30% or less. Our Booth Was Full Of Information And We Kept People Informed With Facts! We spoke to a lot of participants at Magento Imagine with a quest to figure what could be the best for their eCommerce business. We heard them talk and we made sure we gave them relevant solutions to their on-going problems. We recommended businesses with choosing their Magento editions post knowing their average order count. If the business was drawing more than 1000 orders per day, we recommended them to migrate to Magento Enterprise Edition that helps growing sales 3X faster at 50% less cost. We made sure the attendees are aware of how to sell, sell and sell more. Magento Enterprise Edition provides eCommerce business owners powerful merchandising techniques, breathtaking site search results and the ability to segment customers to target them in a more personalized manner. – Nash Ogden, President of The Commerce Shop. We Enjoyed Conversations With Our Clients! Most of the participants had a lot of questions regarding how different The Commerce Shop is from other vendors. We were keeping the participants engaged with a lot of tips to improve traffic to their website. We made sure that we understand the business methods of the participants and we ran a free CRO audit to show them newer techniques in optimizing their website to convert more visitors to buying customers. We enquired the participants about the volume of transactions that usually happens in their website and based on the numbers, we provided the participants with a checklist of “how and what can improve their sales through Magento platforms with a better efficiency, security and speed “. Magento Imagine 2017 was a grand conglomeration of leaders, experts and supporters of the eCommerce ecosystem of the world. It connected a lot of people and enabled them to figure out ways to mutually benefit each other. This attempt to connect stakeholders from different parts of the globe was a much needed for the eCommerce ecosystem to stay balanced without any inequalities. We had a nerdy and super geeky time at Magento Imagine 2017 with a lot of questions arising on the credibility of the new Magento 2. We were well aware of the queries that would possibly come by us regarding Magento 2. The questions were mostly around the stability of the new Magento 2 and the bugs that were recently reported by various other users. Most of the participants were concerned about the readiness of Magento 2 to tackle heavy cyber attacks and its vulnerability. And we were able to successfully alleviate their fears and tell them how Magento 2 is the best Magento version yet. We made them understand the positive impact of Magento in terms of website performance and the implementation of custom functionality. We educated the participants on the new admin menu navigation and improved product page interface. We also cleared all the rumors about Magento 2 and the security issues involved with it by pointing out the exclusive support that Magento renders to fix the bugs and make the module a durable entity. It is high time that the users of previous versions of Magento migrate to Magento 2 since the support for the previous versions by Magento is nearing its end. We were so delighted to share deep and thought provoking insights on page speed insights and how important is it for their site to be mobile responsive. The participants were content about their learning at Booth 16 and most of them were very happy to know about one page checkout processes that The Commerce Shop recommends and offers.